The easy living of a household and the awesomeness of nature – two things which are often mutually exclusive. 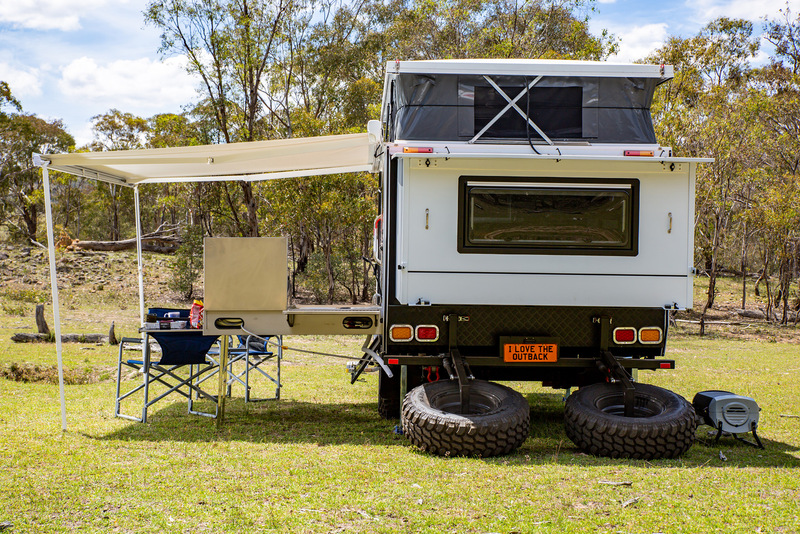 But with the Mars Saturn 13, you can experience both at once, according to the judges who analysed this camper in Mudgee. With minimal setup and maximal features, the Saturn reflects Mars’ ongoing attentiveness to customer demands, making it one terrifically useable beast. Some people like to get out and explore, sleeping under the stars without a thought for the comforts of home. Others like to do the same, but only so long as they can return to a soft mattress and the security of four walls. The latter may well approve of the Mars Saturn 13 Limited Edition. This compact, pop-top hybrid will best suit young or maturing couples (sans kids) wanting an easy-to-use home base to return each evening. And the good news is, at just shy of $40k, the Limited Edition sits at the more accessible end of the hybrid market. At 2000kg Tare, as seen (with the option of reducing to 1750kg), GVM of between 2400kg and 2700kg (depending on your vehicle and needs), and a 2.32m travelling height, there will certainly be limitations on where the Saturn can go, but it’s a compromise you have to weigh up (pun intended). 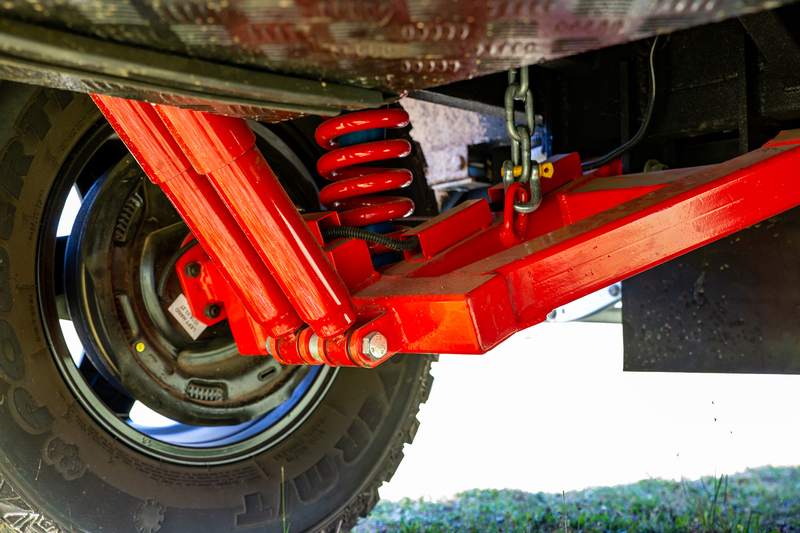 The Limited Edition model has been developed based on what Mars says are its customers’ most popular requests for inclusions – compiling them into one model, as standard, in an attempt to hit the sweet spot. You can always opt up, though, if you desire awning sidewalls, roof-mounted solar or more battery power, for example. The rear fold-out design isn’t new, but it’s a functional and easy setup process that allows you to jump into bed within well under five minutes of pulling up stumps. The inclusion of an internal ensuite with shower and cassette toilet isn’t to be sneezed at, either. Once set up, the interior space is pretty good and the bed area is comfortable and spacious. I thought there was some room for improvement in regards to quality of finish and found the dark grey gloss cabinetry made the interior feel darker and smaller than it might otherwise be. The Mars Saturn 13 is an entry level hybrid, for those without the substantial budget required for some campers in this classification. 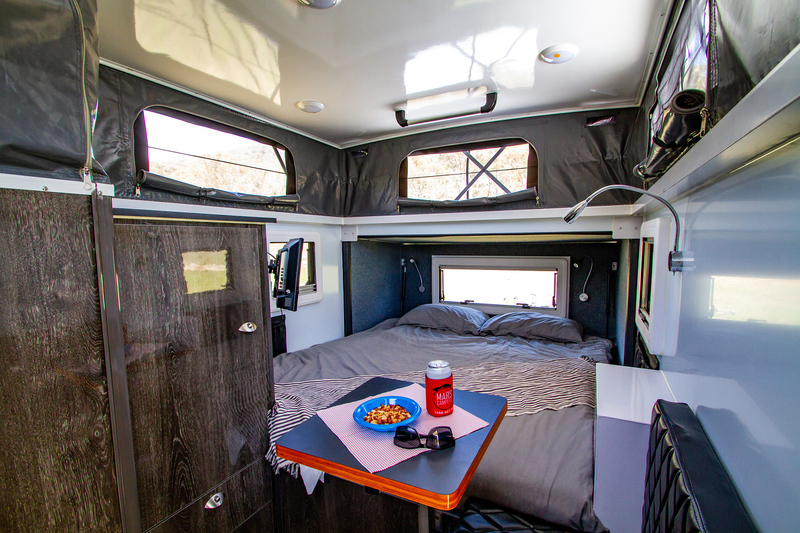 This hybrid had a surprising number of features for the $39,990 drive away price and would be suitable for couples or families where the kids desire to sleep in a swag or tent of their own. 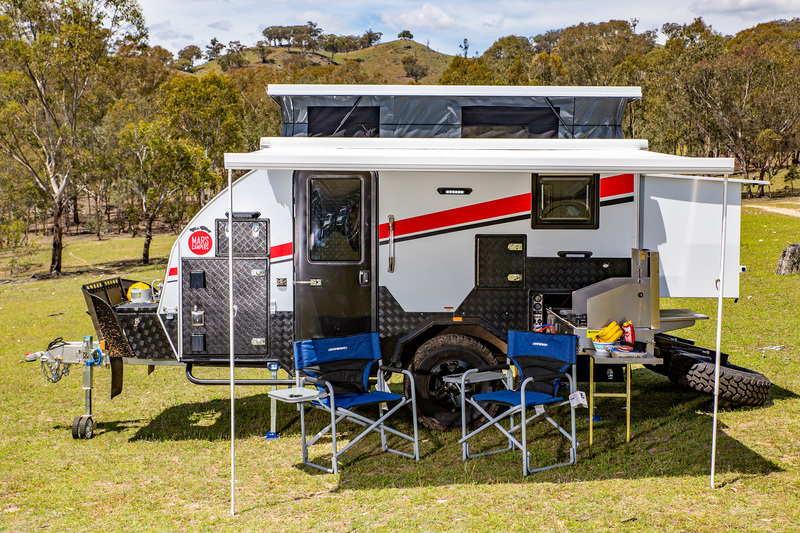 The internal ensuite would endear this camper to many older couples seeking that little extra level of comfort and convenience, but it has the potential to take you a lot further than caravan parks and convenience if you don’t mind the weight. The Saturn 13, as presented, had two 100Ah AGM batteries – with room for a third if desired – in the front boot, with a Projecta Pro Charge 21A mains charger and 1000W pure sine wave inverter. And, while it had 6B&S cable from the Anderson plug through the relatively short distance to the batteries, it would benefit from a DC-DC charger. All the electrical fit-out is done in Australia. There was a 240V inlet and two 240V outlets inside, plus dual USB plugs and 12V cigarette plug outlets. Internally, there are touch LED ceiling lights, as well as wall and bed reading lights. Internally there is a master control panel, with fuses for all circuits, voltage readouts, water tank gauges, stereo/radio, and HWS and powered awning switches. Under the floor are two 100L stainless steel water tanks, plus a 100L grey water tank. Water connects not only to the kitchen but also to a Truma 14L gas hot water service, which also feeds an external handheld shower outlet. 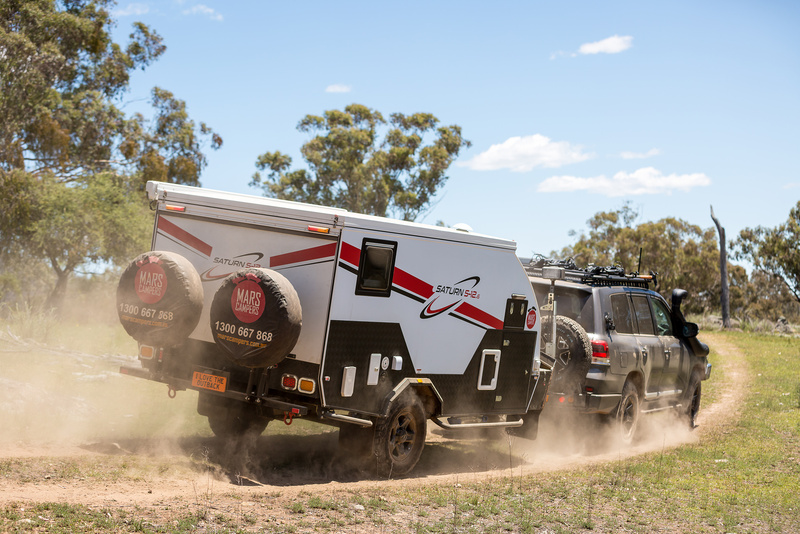 This could all put a load on the gas supply, so the Saturn 13 comes standard with two 9kg gas bottles (these can be downsized to 4.5kg if desired) which, like the rest of the camper, would keep you going for a long, long time. 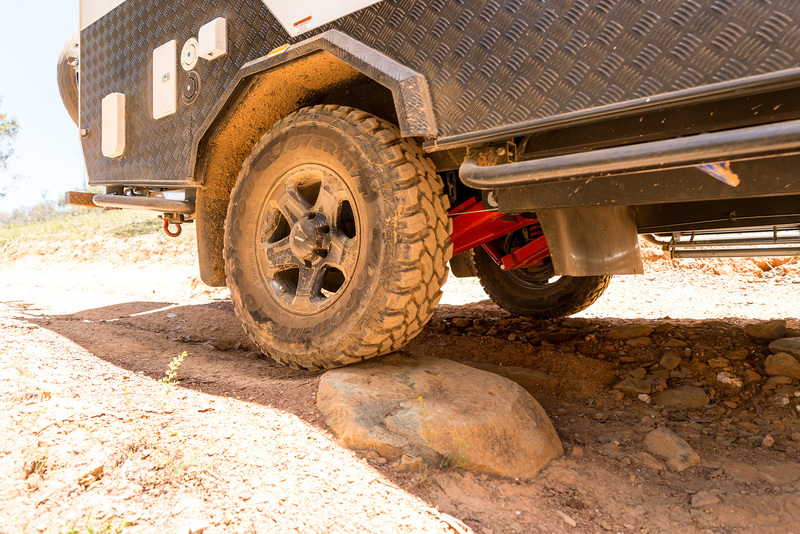 Stepping through the door of the Mars Saturn hybrid camper allows you to quickly pop the roof. Then, you can just as easily, from the outside, fold out the rear wall, allowing the queen size bed to be extended. Then, a couple of latches and the kitchen slides out, giving you easy and comfortable access to the sink and stove. 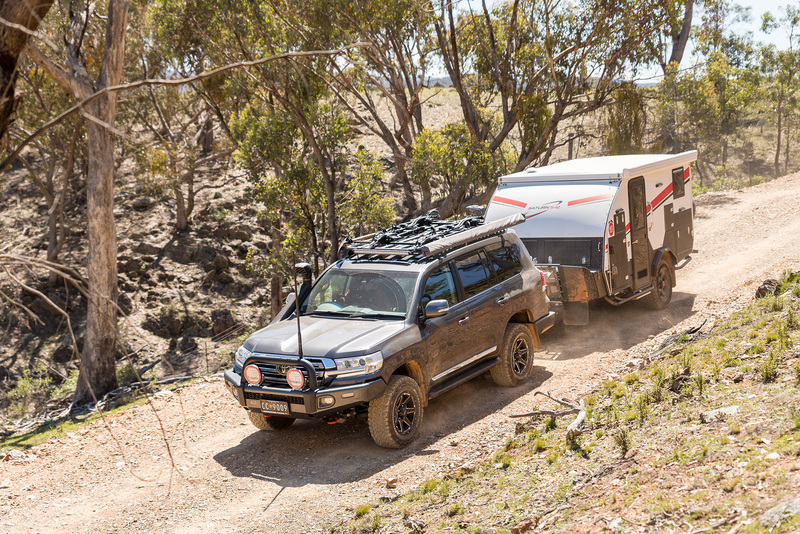 In all, it is a two to three minute job from the time you get out of the tow vehicle to a completely set-up camp, which you’ve got to say is darn near as good as it gets. There are a number of hybrids out there that are similar to the Mars Saturn 13, as they all originate in China. Still, they have some Aussie input and content (to varying degrees), and this one has a good repertoire of products and fixtures that will keep most people contented. 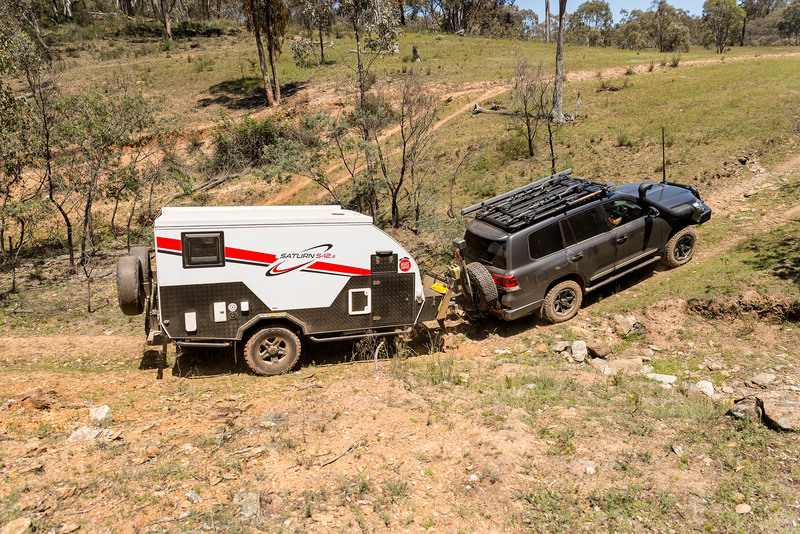 This camper is meant for two people really, as any more would find the available space inside the camper a bit tight. Still, what they fit into this small rig is unbelievable, and as bush campers most of our time is spent outside, isn’t it? Apart from the queen size bed there is a small table and sofa, a TV, a good amount of storage including a hanging wardrobe and shelves, and a few drawers for any goodies or food you need to carry. There is also a sink but I’m not sure why that is included when there is one outside; also, a small stove top would be more usable on those wet windy days when cooking outside can be difficult and unpleasant. The big plus that many people will not be able to go past is the interior shower and toilet cubicle, saving those trips to a distant loo when it is dark and/or stormy. On the outside is the slide-out kitchen. I was most impressed with the tall windshields around this quite big and roomy four-burner stove, plus the couple of drawers giving room for cutlery and the like. A small exterior pantry can be used for everyday, every-meal items such as coffee, sugar and spices. 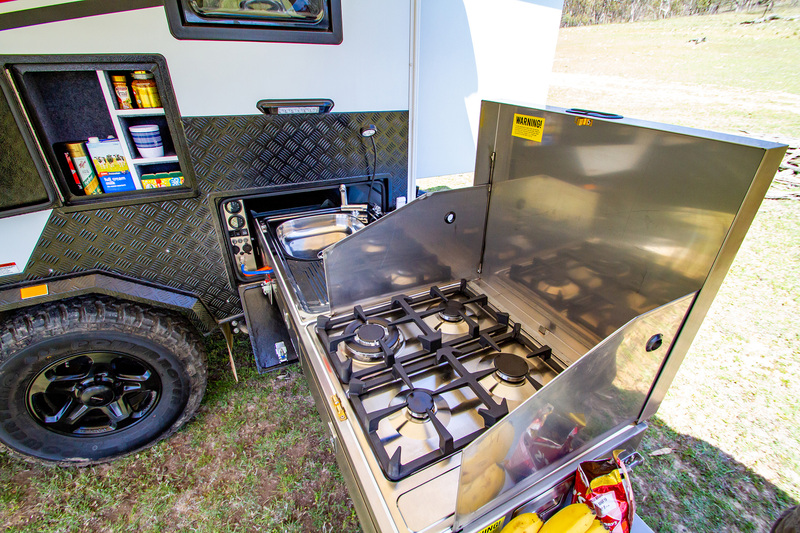 A supplied 75L Waeco fridge/freezer on a separate slide-out at the front of the camper gives ready access to the salads, frozen meats and cold beer. 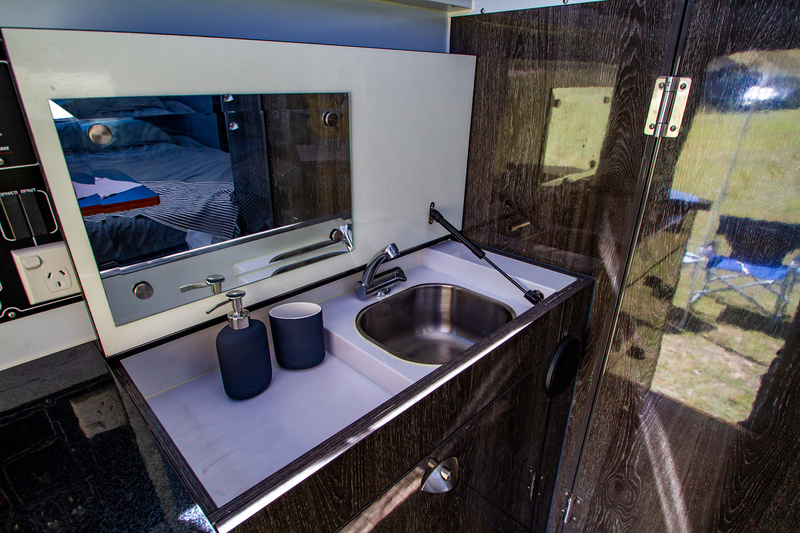 There’s quite a lot of bang for your bucks in this camper and many will love the idea of an onboard shower and toilet, although I’m not so keen on the idea. While it may seem weighty, it has a good payload (and a lot of standard equipment) and it will handle any tracks with ease. The basis of any electrical system is the storage capacity and twin 100 amp AGM batteries will keep the Mars Saturn lit up and rocking for days. Mars also tell me that they are going one step further for future offerings by providing the unit with twin 120 amp Panasonic gel batteries in their continual upgrade program. This little lunar module features a 7-stage Projecta charger plus 50 amp Anderson plug input and optional solar panels (not included in the price). You can have either a 300 watt unit permanently fixed to the roof or portable of your own selection. Inside the cabin is an extensive electrical control panel with individual analogue gauges for your water tank capacity, LED readout for voltage level, and Truma hot water controls. It also features an individual circuit breaker switch panel for lighting, pumping and 12 volt circuitry, plus a dual 240 volt outlet. The 240 volt system features a 15 amp inlet and full circuit breaker. I was pleased to see a 1000 watt constant, 2000 watt peak inverter included in the price for running accessories. The system is also easily expandable for air conditioning and a variety of other electrical options. For entertainment, the Saturn comes with a 12 volt 21” television and Bluetooth sound system. There’s a good array of both internal and external LED lighting with many of the internals being touch-sensitive. Mars have individualised the lighting by also combining flexible reading lights, table lighting and another over the kitchen. We all loved the electrical activated awning that takes any stress out of setup. Gas is also in good supply with twin 9kg gas bottle holders neatly housed in the forward compartment, with certified supply to both the Truma Ultra Rapid 14L hot water system and the external kitchen. Access to servicing and monitoring all of the electrical and gas componentry is very easy, and the switches are all easy to locate and in suitable positions.